Our Accumulator MHE SBL 800 has a horizontal beam on which the carriage moves. A set of (moving) wheels are fixed to the carriage. The "fixed" set of wheels with a pneumatic cylinder can move about 400 mm along the beam, and work as a dancer to keep the cable tension low. The cable loops between the two sets of wheels are supported by horizontal cable supports. The machine is equipped with a Unidrive AC drive only. The whole control system is built inside the drive. The carriage is pulled by a chain from an AC motor which is controlled by a frequency converter. Its speed is controlled by the dancer function and the cable tension is set by adjusting the cylinder air pressure. Three different operating modes can be chosen: 1. DANCER MODE 2. TORQUE MODE. The tension can be adjusted from a control panel which can be mounted freely for easy operation. 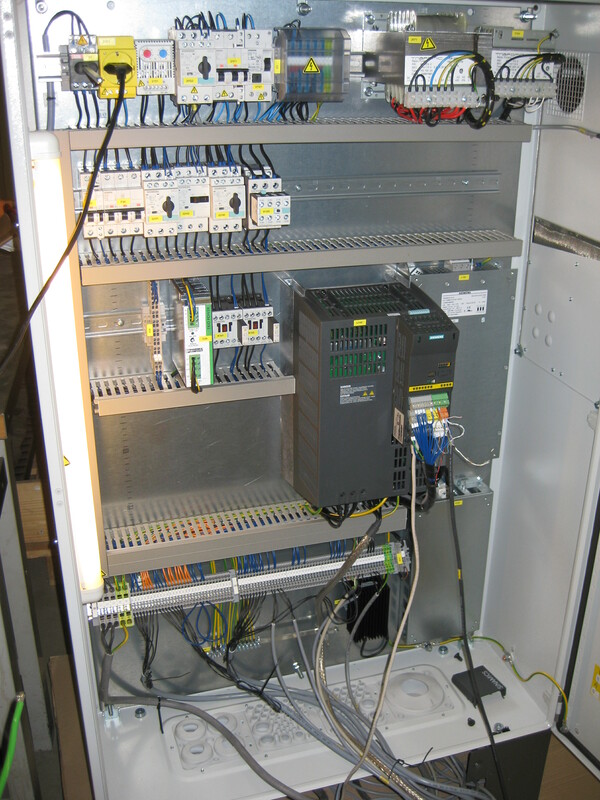 The accumulator is automated and the carriage can be jogged when threading the cable. The accumulator uses composition wheels which allow low tension in addition to great mechanical strength.